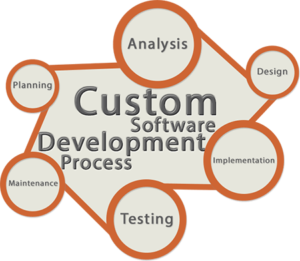 Custom Code software (also known as bespoke software or tailor-made software) is software that is specially developed for some specific organization or other user. Custom software may be developed in an iterative processes, allowing all nuances and possible hidden risks to be taken into account, including issues which were not mentioned in the original requirement specifications (which are, as a rule, never perfect). Large companies commonly use custom software for critical functions, including content management, inventory management, customer management, human resource management, or otherwise to fill the gaps present in the existing software packages. If a you or your company would like a FREE estimate on a custom software project, contact us here.